From information published in The High Peak News on 4 April 1914. Description/Historical Information: Matlock's Fire Brigade including Firemen Platts, Reader, Dunn, Smith, Taylor, Flint, Vallance, Keeling and Froggatt. One name is missing as there are 10 men in the picture. Mr. Moss of the Company of Shand Mason's of London who had just sold a new/refurbished fire engine to Matlock UDC. 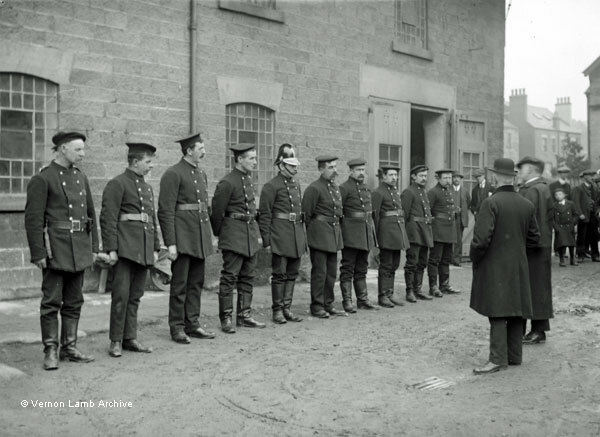 The two men were addressing the brigade prior to a demonstration staged below Rockside. See, in the Uniforms - Non-Military section, VLA4983 | VLA4986.